"2020: Can you get there? A Business Guide for Overcoming Disruption"
Free Best Practices: "2020: Can you get there? 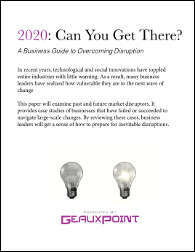 A Business Guide for Overcoming Disruption"
2020: Can You Get There? The rapid pace of innovation and change has toppled entire industries with little warning, and many businesses are at risk. Learn how to expect and overcome disruption. By submitting this content request, I have legitimate interest in the content and agree that GeauxPoint, their partners, and the creators of any other content I have selected may contact me regarding news, products, and services that may be of interest to me.